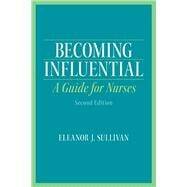 Still the only book of its kind, this intensely practical text helps nurses build the skills they need to gain and use influence throughout their entire careers. This second edition is updated throughout with new information on nursing, health care, and technology including social media. Readable, timely, and upbeat, BECOMING INFLUENTIAL: A GUIDE FOR NURSESteaches through real-life examples, offering proven advice for using influence to solve many contemporary workplace problems. Self-assessments help readers evaluate their current organizational power, communication and goal-setting skills, negotiating and interviewing expertise, and even their abilities to manage confrontation. The book contains specific steps for career planning, resume building, career progress tracking, speech preparation, and more. Flexible learning activities include role plays, debates, observations, interviews, and networking assignments; up-to-date web and print resources support further exploration. 1. What Is Influence and Why Do I Need It?